A timing light is a timing light. Right? In our world of older vehicles equipped with distributors that are timing adjustable, most folks look at setting the ignition timing as a quick and simple movement of the distributor in order to achieve the best performance and/or fuel mileage. And sure, many of us have at some point and time picked up a basic timing light, checked the ignition timing, adjusted it if necessary, then put the light away. End of story. But, could there be more to it than that? Absolutely, with the proper timing light there’s a lot more to the story. We’re going to demonstrate how to use a timing light that can test degrees of advance in not only the mechanical side of the distributor, but also the vacuum advance that’s connected to the distributor. This is also a great way to test for a defective vacuum advance. Is it rocket science? Of course not, and, after learning how to use a timing light that has mechanical and vacuum advance testing capabilities, that old timing light of yours will seem grossly antiquated. For this project we will also need a quality shop manual that shows distributor specifications, such as mechanical and vacuum advance in degrees. In the majority of cases, ignition timing is checked and adjusted after a basic tune-up (or it definitely should be), which would include new ignition points and making sure they are properly adjusted to specs. If ignition points are out of adjustment, ignition timing can’t be set properly. First priority is to make sure the ignition points are in perfect working order and set to factory specifications. If you have electronic ignition, air gap adjustments are, in most cases, not necessary. For many years in my own shop, I have used Actron electrical testing equipment with great success. 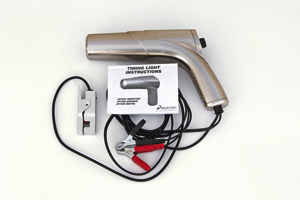 The timing light is the Actron “Advance Timing Light” CP7528, designed to not only check base timing, but also test mechanical advance, and vacuum advance (showing actual degrees of advance). It can be purchased at most auto parts stores all across U.S., Canada and Mexico, for somewhere between $50 to $100. Prices will vary depending on what part of the world you’re located. OK, the ignition points (if used) are spot on, engine is running at normal temperature (at idle), transmission is in neutral (or park), and the emergency brake is set, with the drive wheels blocked. Always use caution, wear safety goggles and avoid any and all moving engine parts. Now connect the inductive pick-up clip attached to the timing light to the number one spark plug wire. Now connect the red alligator clip to the positive (+) post on the battery and the black alligator clip to the negative (-) post on the battery (for 12-volt negative ground systems). Instructions are supplied when connecting to a 6-volt system and a positive ground system, so follow the instructions to the letter. With the on/off button energized, the Xenon strobe light should now be flashing to the pulse of number one cylinder’s firing sequence. If not, check the connections. By pointing the flashing strobe light at the timing plate located near the crankshaft pulley (Caution:beware of moving engine parts), the mark on the crankshaft pulley should now become visible at least somewhere on, or near the attached plate. Our subject vehicle is a 1966 Corvette with a 327ci, 350hp engine with both centrifugal and vacuum advance capabilities. This required disconnecting and plugging the vacuum advance line for checking “base” timing. Base timing is the first test performed on any distributor-equipped vehicle. Mechanical and vacuum advance systems will be tested after the base timing is set to specs. There are two types of vacuum supply systems used for vacuum advance units. Any vacuum line that is connected to a direct vacuum source, or below the carburetor throttle plate/plates, is referred to as manifold vacuum, meaning it gets a constant, direct source of vacuum. Any vacuum source that is connected above the carburetor throttle plate(s) is called ported, or off-idle, meaning the engine must be at cruising speeds or at slow acceleration to achieve a source of vacuum. A generic test to find out which vacuum supply you have would be: after disconnecting the vacuum line from the distributor, put your finger over the open hole in the line with the engine at an idle. If there’s vacuum, it’s manifold; if not, it’s ported. Either way, you’ll need to plug the opening. In our case, the timing was retarded by approximately two degrees and one good indicator of why the vehicle was sluggish on acceleration. By loosening the hold down bolt on the distributor and moving it counter-clockwise, we set the timing to factory specs (in this case, 10 degrees at an engine idle of 650 to 750 rpm). Now, the base timing has now been set and the vacuum line we previously disconnected is still disconnected, and plugged off. The shop manual called for a mechanical advance factory reading of 15 degress with the engine rpm held at 1,500. We pointed the light at the timing plate (the mark on the balancer was now above our original base setting, which is normal) and we then turned the rear knob clockwise until the mark on the harmonic balancer moved back to “0” on the timing plate. The reading on the dial was 15 degrees. This showed that the mechanical advance was working as designed. Next, the engine was returned to idle, the dial on the back of the timing light was reset to “0,” and the vacuum line re-connected to the vacuum advance unit. At this time by re-checking the timing setting, there should have been an automatic increase in the timing adjustment (which would mean the advance unit was in working order). There was no timing increase. Remember, it was a direct manifold vacuum source, so this was an easy way to find out that our vacuum advance was defective, and another cause for hesitation on acceleration. After replacing the unit we continued our timing inspection/adjustments by re-starting the engine, and bringing the rpm up to 1,500. We then turned the knob on the rear of the timing light (again clockwise) until the mark on the harmonic balancer aligned with the “0” on the timing plate. The numbers on the timing light dial read 29 degrees showing a total advance for mechanical and vacuum combined. Our distributor was now refreshed with new points and condenser, plus a new vacuum advance, which made a world of difference in not only overall performance, but the fuel mileage also increased dramatically. And, at over three bucks a gallon, that’s a good thing. In the days of leaded fuel, ignition timing could be off by any given number of degrees, and the engine still gave reasonably good performance. Today, due to the unleaded fuels and the ethanol mix, ignition timing is critical for best performance and fuel economy, especially for an older vehicle that was not designed to use today’s gasoline. Can the timing be adjusted on most modern day vehicles? In the majority of cases ignition timing is computer controlled and non-adjustable. We have another Glitch Pack set to come from adidas Originals using the NMD. Launching in 2017 is the adidas NMD R1 Glitch ‘Solid Grey’.Looking closer at this adidas NMD R1, they come dressed Adidas Outlet in a clean Solid Grey and White color theme. As you can see, the Glitch pattern is seen through the base that extends across the tongue and around the heel. White then NMD Human Race hits the Three Stripes and overlay on the heel. Other highlights include 3M reflective details, White Boost midsole along with White and Grey across the EVA Pod overlays.Keep scrolling to check out Adidas NMD XR1 a detailed look of the adidas NMD R1 Glitch Solid Grey. While expected to be apart of a new pack, they are going to launch at adidas Originals retailers during February 2017. NMD Human Race Yellow Retail price will be $130. adidas Originals is once again offering something new across the adidas NMD line. Shown is the new adidas NMD R1 Trail models that will be available for Yeezy Boost 350 Moonrock Fall and Winter.The colder weather ready adidas NMD shown will release exclusively for women. Both pairs comes with a stretch nylon upper allowing for comfort. Across the heel of the two is Adidas Shoes waxed suede that adds in durability. One pair will feature a shade of Blue across the uppers and Pod EVA plugs while the second comes in Brown with red detailing. Finishing the adidas store look of the two is a White Boost midsole and rugged trail outsole.Below you can check out additional images of the two adidas NMD R1 Trail releases for Fall. They will be adidas shoes available at adidas Originals retailers in Women’s sizing on October 1st, 2016. Geek Squad offers you various computer related services and accessories for customers Geek Squad provides services in store, on door step, and over the Internet via remote access, and also provides a 24/7 and 365 days telephone and emergency on-site support and services.